Earn $0.42 in VIP credit (42 points)What's This? Have you ever put a pair of brand new (and expensive!) tires on your bike only to have one or both ruined by a road hazard within the first few rides? Well, the same thing has happened to us...and it can be very frustrating. We can't sweep your roads clean, but we can make it a little easier on the pocketbook. Clincher replacement tires are provided FREE. Tubular and tubular-clincher replacement tires are provided at a 50% discount. We ask that you return the damaged tire to us at your expense. We will cover the cost of shipping of the replacement tire(s). Minor punctures which can be repaired with a new tube or sealant in a tubular is not covered. Limited to ONE replacement per tire. Insurance covers up to ten tires purchased in a single order and is intended to cover individual or family use. Please contact us for a special quote for club or team coverage. I put in about 200 miles a month, sometimes a little more. At 60 days, the tires are just getting warmed up. This product, although a great idea, is definitely for that early out of the box catastrophe that is mentioned. Murphys law says your gonna jack up your new tires within the first few rides. Happened to me twice. Road hazard warranty for a few bucks kept me cool. How awesome is this product? I don't need it when i buy my Gatorskin Hardshells but this is an absolute must when purchasing any racing tires. BTD you are the bomb. Cheap insurance for road hazards. I have had to replace new tires with less than 200 miles on them. The tires were replaced in a timely manner with no problems. 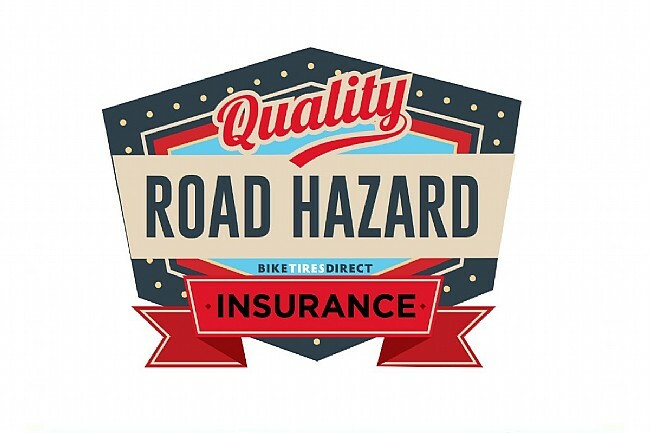 I purchased the Road Hazard Policy with my recent order of the Continental Grand Prix 4000s and I'm glad that I did. Based on some reviews, they claimed that the side walls were prone to cuts. Within 100 miles I was standing on the side of the road, wrapping my tube in a $ bill. Thankfully I purchased this and knew I wasn't out the cost of a new tire. No stress at all. Customer service was excellent as usual. A+. Definitely will purchase again. 2nd ride on my rather expensive tires rear got a 1/2 inch slashed. must have run over glass. Made the dreaded call to the Mrs. But felt good that i had opted for the inexpensive tire insurance. Bam, new tire in the mail, and i'm back on the road. In our case paying for the insurance was wonderful. Dealing with BikeTiresDirect has been great. No complaints and will buy the insurance again in the future. The tires were purchased for my husband who is a cycling enthusiast. It's happened to all of us, we JUST put new tires on and ruin one beyond repair.